As with the 4:1 and 6:1, the 9:1 can be rigged as either a simple or compound system. Simple 9:1 systems are completely impractical. 'Nuff said. Compound 9:1 systems are a piece of cake if you already know how to rig a 3:1. Shown here for its educational value; don't try this at home. By definition, compound systems have one simple system connected to another simple system. In this case, we've stacked a 3:1 on a 3:1. 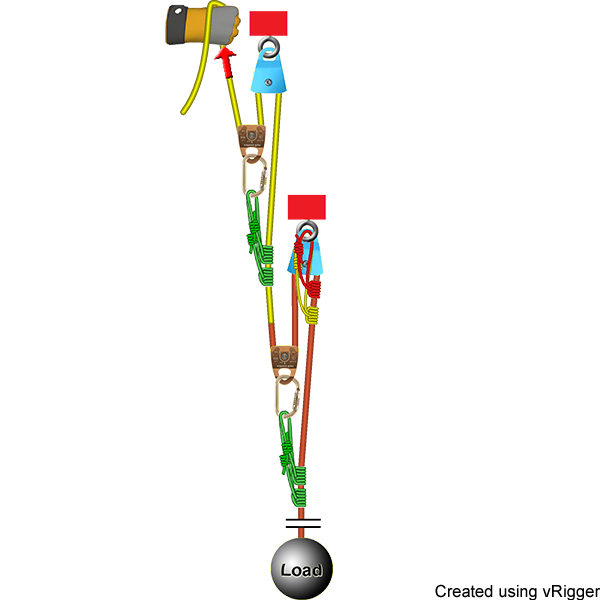 Although this is a compound system, you can see it was rigged using a single rope (we changed the rope's color from yellow to orange to show where the two 3:1 systems meet). Notice that the capture Prusiks are on the rope coming from the load and not on the upper anchor. 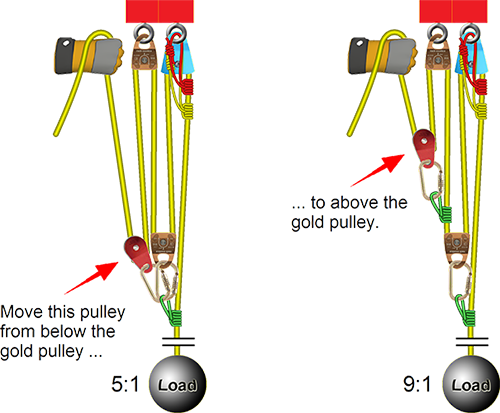 Creating a compound 9:1 on staggered anchors, as shown here, requires a relatively large rigging area, but it is much easier to visualize the two 3:1 systems and it is easier to reset the systems. 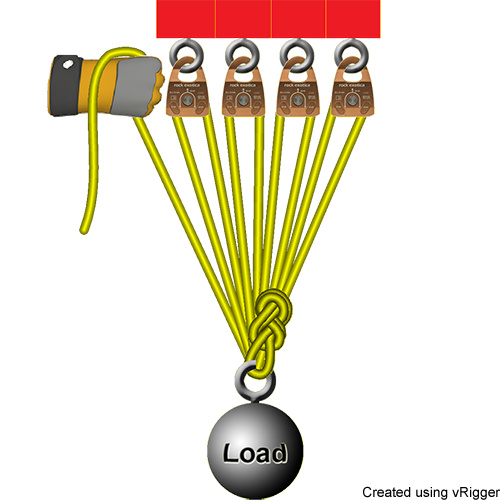 As shown in this illustration, you can change a simple 5:1 into a compound 9:1 simply by moving one pulley a few inches (i.e., by moving the red pulley from below the gold pulley to above it).